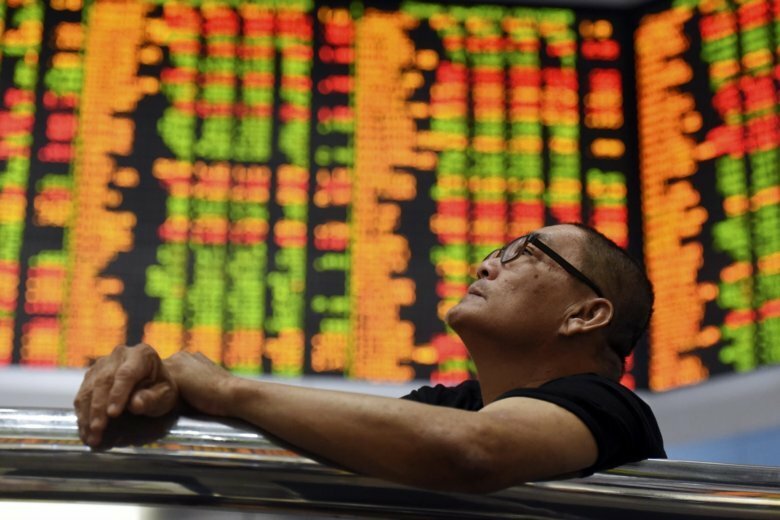 SINGAPORE (AP) — Asian markets were mostly lower on Friday after U.S. Vice President Mike Pence claimed China had meddled with its midterm elections to unsettle the Trump administration, which Beijing has denied. KEEPING SCORE: Japan’s benchmark Nikkei 225 fell 0.8 percent to 23,784.64, and the Kospi in South Korea dropped 0.6 percent to 2,261.89. Hong Kong’s Hang Seng fell 0.4 percent to 26,512.16. Australia’s S&P/ASX 200 gained 0.3 percent to 6,193.30. Stocks fell in Taiwan, Singapore and Indonesia. Markets in Chinese mainland were closed for a national holiday. WALL STREET: A sell-off in U.S. Treasury bonds, particularly longer term ones, sent interest rates sharply higher on Thursday. Fears that higher interest rates could eventually slow economic growth by making borrowing more expensive weighed on major U.S. indexes. The S&P 500 index gave up 0.8 percent to 2,901.61, and the Dow Jones Industrial Average lost 0.7 percent to 26,627.48. The Nasdaq composite tumbled 1.8 percent to 7,879.51. The Russell 2000 index of smaller-company stocks was 1.5 percent lower at 1,646.91. CHINESE MEDDLING: U.S. Vice President Mike Pence accused China of taking public and covert measures to interfere in the upcoming U.S. midterm elections. This includes targeting Chinese tariffs to industries in states that are crucial to Trump, intimidating scholars, and coercing U.S. businesses to speak out against the Trump administration, he said. Pence charged that Russian influence operations in the U.S. “pales in comparison” to Chinese operations. “China wants a different American president,” he said. Chinese foreign ministry spokeswoman Hua Chunying said Pence’s allegations were “groundless.” Separately, Bloomberg reported that China had inserted tiny chips into computer equipment manufactured for the U.S. to steal its technology secrets, citing corporate and government sources. Apple has dismissed the report. ENERGY: Benchmark U.S. crude added 47 cents to $74.80 a barrel. The contract lost 2.7 percent to settle at $74.33 per barrel in New York. Brent crude, used to price international oils, rose 37 cents to $84.95 per barrel. It shed 2 percent to $84.58 per barrel in London. CURRENCIES: The dollar strengthened to 113.91 yen from 113.86 yen on Thursday. The euro fell to $1.1506 from $1.1515.